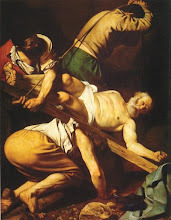 By The Brook: "You must die to live"
That's what the Gospel said today, right? The grain of wheat falls to the ground so that new life might spring up. Christ died so that we might share in eternal life. 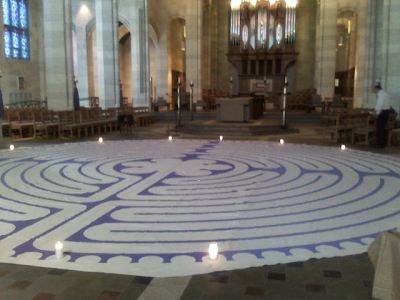 Behold Bishop Matthew Clark's new vinyl labyrinth prayer mat in Rochester's Sacred Heart Cathdral! Go on over to Rich's blog, Ten Reasons (from whence I swiped these photos), and scroll through the posts and better yet, the comments. 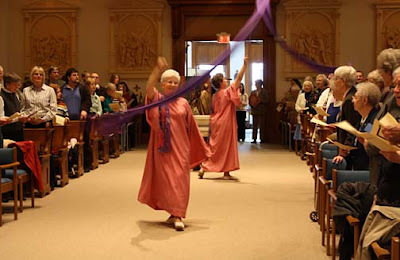 The death of Catholicism this Diocese (its murder, really) is a tragedy - thousands upon thousands of lost souls, and thousands more misguided and lied to by the liberal snake oil being sold to them each Sunday at travesties like this. The few brave souls who stand up for the Faith are ostracized, marginalized, and branded as crazies and/or troublemakers. But I say we crazy troublemakers are the wheat, and in a little over three years, when the detritus is cleared and the current Bishop decamps for parts (hopefully) unknown, we will grow...and the splendor of Tradition and Truth will return. 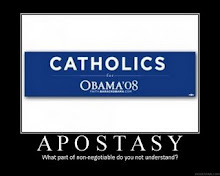 Labels: Apostasy, DOR Atrocities, Heresy, Loser(s), Sacrilege, TSTL, WTF? I think I gotta stop reading all these blogs just before bed. The other night (after reading about the labyrinth monstrosity at the Cathedral) I dreamt that I was at the Cathedral because my 9-year-old was getting the CYO Faith in Sports award (which she really is getting tomorrow), but when we got to the Cathedral, there was a giant Parchesi board where the labyrinth currently is. Then the floor changed to a giant chess board with Bishop Clark standing in the spot where the bishop is placed at the beginning of the game. Those scary reiki dancing ladies were in the places of the pawns. My girls (who are all avid chess players) were all excited about playing human chess with the Bishop. I became irate (like Jesus with the money changers) and started yelling at the girls to shape up and treat the Cathedral with reverence. That's when I woke up... Lord have mercy! 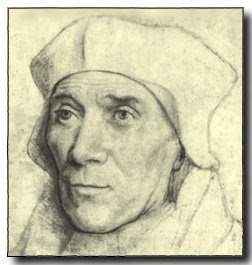 I saw on breitbart that the bishop of Rochester quit and got all excited and tingly for a moment until I realized this chap was not catholic and it was in the UK. Weh. If I wanted a labyrinth, I would buy a bvook of mazes. Wow - those pics leave me speechless. Good Lord, at first I thought this was photoshopped. Reiki is a New Age proctice condemned by the Vatican. labryth Walking is a neo-pagan practice very popular among middle aged "witches" who are tryig to be cool and mack on college boys. (this is my first hand observation) and women waiting to be ordained. Kit...I have to say thank you for posting these. Every time I worry about the state of my own diocese, I have only to look at Rochester and LA to be comforted. Here, the parishes where *that* level of yuckiness are practiced and/or tolerated - well, they do exist, but they tend to be notorious. Don't get me wrong; there's plenty I could complain about here. But we don't have it anywhere near as badly as you guys do in the DOR. There is a live labyrinth in Spokane at one of the church retreat places. 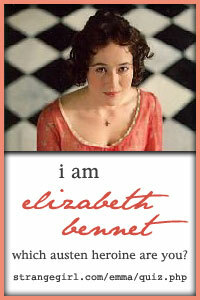 I understand it is quite beautiful and restful to wander through. However, I do not understand how a labyrinth has anything to do with Christianity. Mostly, I cannot freaking believe that anyone would put a blue(?) and white vinyl anything in a church of any denomination - let alone an ornate and sacred cathedral. Oh, yeah - last fall, the local Methodists put up a big white and red vinyl banner across the front of their brick church building. It lasted about a week before the wind tore it to shreds. Unfortunately, the wind probably can't get to the prayer mat. I think so - along with the joyous installation of a new Bishop. Vinyl. Ugh. It even smells funky.